If you don't have confidence within yourself, why would anyone else have confidence in you?A lack of self confidence can affect anybody, whether you're the director of a company or a student at university, you can be taken advantage of, passed over for promotion without achieving your potential. When you have self-esteem, assertiveness and confidence you stand up for yourself, you know what you want and go for it. You are the best you can be. 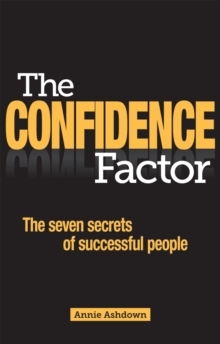 Annie Ashdown, Harley Street Master Hypnotherapist and Confidence Coach, had no confidence for many years, but gradually developed the 7 secrets to self-confidence which transformed her life. Packed with insightful advice, top tricks and tips from successful people and practical techniques, The Confidence Factor reveals the secrets for gaining confidence, explains what is confidence and how to be confident, discover: Accessible advice and practical tips on gaining self-confidence Straightforward techniques that have immediate effect The confidence tricks high-profile successful people use The seven traits of self-confident peopleThe Confidence Factor will explain the 7 simple steps to getting confident and mastering your emotions so you can feel strong whatever life throws at you.